Jimmy Beadle's brace of goals helped Trafalgar win 4-1 at Division Two champions Angel to move into the semi-finals of the Scarborough & District FA Sunday Cup. Traf created numerous chances in the first half and it was a cracking goal to open their account, former Scarborough ace Beadle firing a 15-yard strike into the top corner beyond the reach of Angel gloveman Scott Wardman. This lead was doubled before the interval when Gary Thomas put the ball into his own net after fine attacking play from Mikey Barker. Angel gained a foothold early in the second half when Danny White brought down David Bell to concede a penalty, which was confidently despatched by Neil Thomas and for a 20-minute spell the home side applied pressure and looked set to get on level terms. Traf's defence held firm and Beadle restored their two-goal lead with a 20-yard effort which fizzed into the top corner after good work on the right flank from Wayne Aziz. Liam Salt's goal made sure of the win and Traf's place in the final four. Traf boss Col Jenkinson said: "It was a great team performance once again, but Sam Pickard was man of the match as he was so strong today, just edging out Jimmy (Beadle) and Niall Gibb." Angel's joint player-boss Dan Jones said: "Man of match for us was shared by Gary Thomas and Callum Gravestock, while Neil Thomas also did very well. We didn't embarrass ourselves at all they just got the run of the green and punished us. Sam Pickard and Jimmy Beadle bossed it for them." FILO booked their place in the semi-finals of the Senior Cup with a 5-2 win at Cayton Corinthians. Harry Smith gave the visitors, who travelled south with a bare 11, the lead on 25 minutes, lifting his shot over the Cayton keeper. 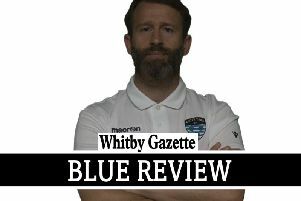 Smith then added a second to put the Whitby side in charge and Jimmy Landers made it three on the stroke of half-time with a cracking 20-yard shot which flew into the net off the crossbar. The visitors raced out of the blocks after the break and added a fourth when Luke Storr slotted his shot under the home gloveman. The villagers fought back into the game with goals from Brad Marshall and Jake McAleese, but Dave Welham's header from a Phil Spencer corner on 75 minutes confirmed the away team's place in the final four of the cup competition. Central midfielder Paul Tose was man of the match for FILO with Tom Venner the star man for Cayton. Fylingdales completed the semi-final line-up, with Newlands and Ayton already having booked their places, after easing to a 10-0 home win against Heslerton. Harry Purves led the way with a hat-trick, while man of the match Mikey Kilpatrick and Jake Faichney slotted in a brace apiece, with goals from Tommy Gray, Sam Richardson and an own goal wrapping up the win. Fylingdales boss John Cuffling said: "Kilpatrick richly deserved his star man award, claiming four assists in addition to his two goals, he hit the post and had numerous efforts and had the Heslerton right-back on toast. "All the scorers did well, with Jack Pearse, Taylor Humble and Sam Bailey also impressing." Danny Alexander was man of the match for Heslerton. Crown Tavern continued their improvement with a 4-1 home Division Two win against Scarborough Campus. The home side went 1-0 up in the first half when James Burrows half-volleyed into the top corner. Steve Chittenden made a superb goal-line clearance to maintain the slender Tavern lead after the interval and Burrows then added a second through a breakaway move soon after. James Day made it 3-0 with a header, and then added a fourth when Sean Hope swung in a free-kick to the back post for Leeroy Donaldson to head home. Five minutes from time the students grabbed a deserved consolation through Aaron Padgham. Burrows was named as the man of the match for Tavern, with Adam Martin the star man for Campus.